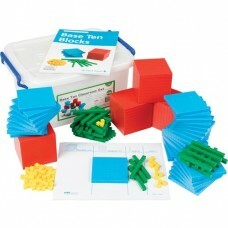 Base Ten materials assist students in understanding the relationship between units, tens, hundreds and thousands. The colours help emphasise the base ten nature of the number system, and make it simpler for students and teacher to describe what they are doing. A 25 sheet base ten pad. A durable plastic container for easy storage.